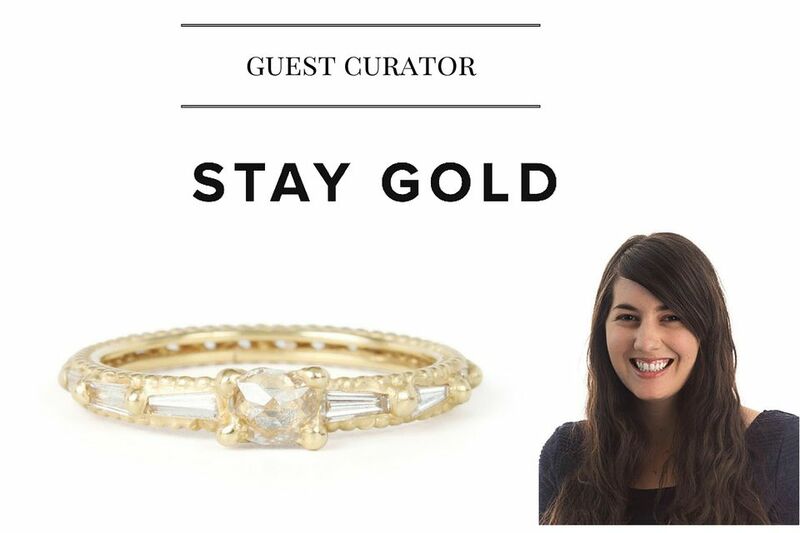 During my recent trip to Denver, I spent a wonderful afternoon with Liz Kantner, author of the amazing jewelry blog, Stay Gold. Clearly we have a lot in common and had a great time talking shop, exploring the engagement ring possibilities at Victoriana Antique and Fine Jewelry and all the new jewelry collections on offer at Goldyn in the Highlands. Liz always has the inside track on all the cool, new, up-and-coming jewelry designers, frequently visiting their showrooms to uncover their unique processes and inspirations. So naturally I was dying to have her curate a selection of her favorite engagement rings, exclusively for About Style readers! “Engagement rings and wedding bands are exciting to me because they’re so special and personal," says Liz. “They’re heirlooms that will be passed down to future generations. I love that engagement rings are getting thinner and more stackable, so you can keep adding rings to your set. I also like that more people are choosing alternative options—you don't have to have a diamond." You heard the lady… Click through to see her favorite engagement rings—she stopped herself at 16 and her picks are definitely sweet! "Classic, but also unique. Each of Polly's designs is a wearable work of art." "A very simple, yet interesting option. Great for stacking and, in sterling silver and white topaz, so affordable!" Exclusive Slideshow of Wedding Rings NOT for the Faint-of-Heart!